Cardiac complications secondary to iron overload are the leading cause of death in thalassemia major (TM). Both magnetic resonance imaging (MRI) T2* and T2 have been validated as non-invasive means for assessment of myocardial iron overload. While T2 is dependent on the exchanging of energy with nearby nuclei, T2* is additionally affected by magnetic field inhomogeneity. It has been hence argued that T2* may be less accurate for tissue iron quantification because of its sensitivity to shimming, susceptibility and other factors. Therefore, it is of clinical interest to investigate the relationship between tissue T2* and T2, particularly in the heart. The T2* technique has showed interstudy reproducibility  and interscanner transferability [2, 3]. A breath-hold T2 technique has also been developed which was reproducible and demonstrated clinically relevance compared with T2* [4, 5]. The recent advance of a black blood T2* technique  and the development of improved post processing T2* analysis routines [7, 8] further improved the reproducibility and accuracy of the measurement. All these advances make it possible to reliably compare T2 and T2* measurements on a large scale of patient population, which can help better understand the relationship between T2 and T2* in iron overloaded heart hence improve the diagnosis and management in the transfusion dependent patients. In this study therefore, we were aiming at the direct comparison of myocardial T2* and T2 measurements in vivo in order to establish the relationship between them. We hypothesized that T2* will correlate with T2 linearly when iron becomes dominant in the myocardium. 132 TM patients (age 27 ± 11 years old, 64 males) were studied on a 1.5 T MRI scanner (Siemens Sonata) using a cardiac phased array coil and with ECG gating. All patients were scanned using the black blood T2* sequence and the T2 sequence subsequently, each within a breath-hold. A single mid-ventricular short axis slice was imaged with both T2* and T2 measured in the left ventricular septum (Figure 1). The mono-exponential decay model and the nonlinear curve fitting algorithm were employed for the patient data analysis [7, 8] (CMRtools, Imperial College London). Drawing of ROIs in the left ventricular septum from the same subject. Left: Black blood T2* image at TE of 2.52 ms. Right: Black blood T2 image at TE of 4.8 ms. Figure 1 demonstrates exemplary T2* (left) and T2 (right) images from the same patient, where blood signals are well suppressed and clearly defined myocardial borders shown. Figure 2 shows the correlation curve between T2* and T2 drawn from 132 thalassemia patients. There was clearly a good linear correlation (R2 = 0.885) between myocardial T2* and T2 measurements in the septum in iron overloaded patients (T2* = 20 ms). In the normal group of T2* > 20 ms, however, no linear correlation between these two measurements was found. Correlation between T2* and T2 drawn from the 132 thalassemia patients. 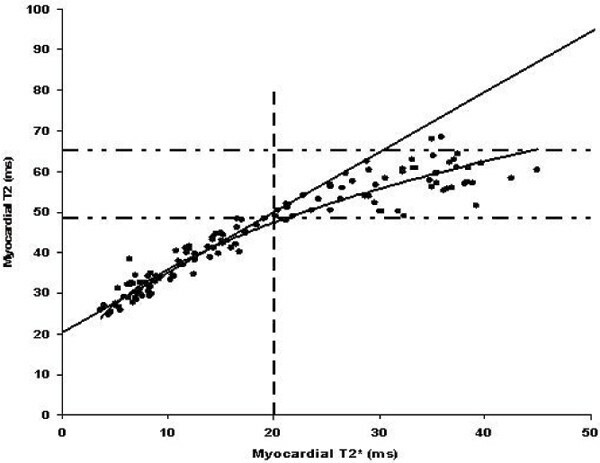 The vertical broken line represents the threshold myocardial T2* value to distinguish abnormal and normal patients. The horizontal broken lines represent the normal reference ranges for myocardial T2 from previous published data. The whole data is fitted by a quadratic curve (curved line, R2 = 0.938). All data of T2* ≤ 20 ms is fitted linearly (straight line, R2 = 0.885). This original study demonstrated that mrocardial T2* correlated linearly with T2 measurements in patients with iron overload, which suggests that both T2* and T2 can be used for the reliable assessment of iron overload in the heart. A myocardial T2* of 20 ms is a useful threshold to identify patients with cardiac siderosis. Myocardial T2* measurements correlated linearly with T2 measurements in TM patients with iron overload, suggesting that both T2* and T2 can be used for assessment of iron overload in the heart. This work was supported by NIH Grant: R01 DK66084-01.